I dont know if anyone knows this yet but www.RCTimer.com has been getting into multi rotors lately, they recently came out with DJI clones and now they are selling them which seems like a good price. Plus they have the KK board 5.5 (probably a clone) for extremely cheep. Just wanted to tell you guys about it. Thanks Johntra !! I always loved the RCTimer brushless motors and esc's, they are great. They charge very low shipping and they ship FAST ! Thinking about ordering the RM450 V2 frame. I still have 4 of the 2212-15 (930kv) and some 30A esc's. But I also heard that the landing gear/strips are quite weak. But I noticed that they also offer spare arms (!). But hey, usd30 + usd2 shipping is a good deal I think !! What about you ? I think I am going to wait until they have the 450 V2 on the kits and pick up a NAZA off of eBay. I just really like contacts to solder to. Johntra, I just had contact with Nina from RCTimer and they will inform me as soon as the V2 kit will be available. Keep you updated ! Mark. They are now available. That was fast. 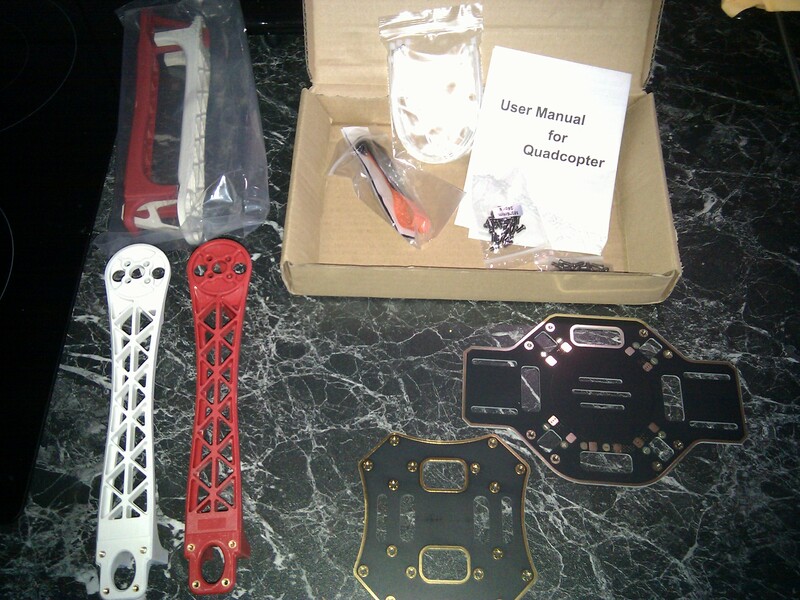 I ordered a v1 as I already have a PDB (power distribution board) I can use. That was fast indeed .. ordered the V2 kit this morning. Will post a build thread soon ! RCTimer (Nina) has the best customer suport that i've ever experianced with an RC-webshop .. I have to make a review and build log to thank RCtimer for this. Wow. Thats a nice mess up. The supplied allen wrench is crappy (soft material) I used quality bits instead. It is much easier to solder ESC's if you do not bolt it together completely. I will have to undo all screws again as I will solder to the lower plate and when its time for assembly I will use blue Loctite. It was meant for the Naza controller. But i was always confused about that controller cause the mount it on the side which isnt the cg. I thought the controllers always had to be over the cg? OH and also. Do you think it is as strong as the real dji flamewheel? I will compare this frame to my own DIY frames - I cannot compare it to the original, so far it feels just as rigid as my own frames made from 10*10mm aluminium. Looks cool! Cant wait to see it fly!